Experiencing different things on different days are very common things and similarly facing tough times is also very natural. As per our daily routine, it is not possible that the day we spend working or chilling can be tagged as an awesome day of our life. There are some criteria that specifies that the day we are enjoying is one of the best day of our life. Those criteria may differ from person to person who is experiencing such changes in their personal and professional life. Each and every day of a person’s life comes with a new agenda and that can be anything but surely surprising. Sometimes things that happen in our day to day life may seem little uncontrollable for us, but sometimes we can control our life and spend our day according to our wish and wants. 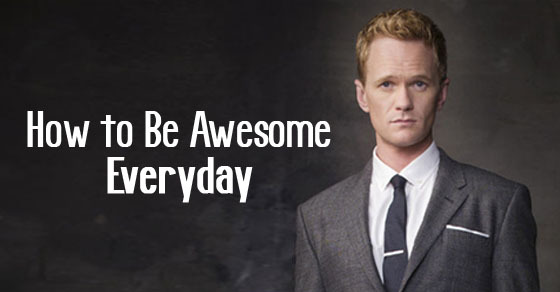 There are some of the ideas to make everyday an awesome day and they are. It is common to think that most of the people prefer themselves over other people, when it comes to the luck matter or happy day kind of stuff. It is possible that most of the people start their day looking themselves in the mirror because it helps them gather courage and talk directly to themselves through mirror without any middlemen. Some people think that it is a bad thing to do and they prefer not looking themselves in the mirror to kick start their day. Some people have a habit that after getting up of good night’s sleep they just don’t get up of bed like that, they try to see that thing first which matter to them most or makes them happy every day. Most of the people live their life thinking about their family, spouse, children and it is common to understand that they consider their loved one’s as a tool of their happy day, which is sweet and very caring thing to do to start their awesome day. Our eating habits affect our day to day life. Most of people start their day with a breakfast which is the important meal of the day. Skipping such important meal of the day is a big mistake that one can ever do. Therefore, it is necessary to understand the value of a healthy breakfast to kick start your day. As per some of the food preferences, there are some people who prefer to start their day with unhealthy and oil food that can ruin our day without any doubt, it normally makes a human body lazy because of its oily and unhealthy elements. Some doctors suggest that if a person tries to laugh or smile every day without fail, then it is possible that their health and their day will be great at the end of each day. Smiling is a healthy habit that can reflect in return if a person try to converse with a smile. Smiling makes things turn positive. Sometime it happens that things that are very important to a person may turn in a negative way and it will end up screwing things up, but at that time instead of worrying about such work if a person smiles and accepts it, then it can be easy for them. There is a saying that if a person have sweets or deserts before doing anything important in their life, then it is possible that the work they are thinking of starting may create a positive difference in their life. Most of the people who start their life thinking that it is going to be great as usual, then they should try to have sweets or desserts before starting their daily work. It is a positive signal that can work things better. Most of the time it happens that we carry each day with a simple way of living and never try to do something different in our life. It is possible that whenever a person thinks of starting their daily routine, he /she may feel that it is boring to do usual things daily for their livelihood. And they start wondering whether it is possible that they can try something different in their life and start a better day than usual. By trying out something creative in life, it is possible that they may start their life greatly with every single day. As mentioned earlier, most of people think that their secret behind a happy day or an awesome day, must be considered as their loved one’s. Most often it is considered that if a person takes his / her family as a secret behind his / her success, then he / she may end being polite and honest in his / her life. Most of people experience that whenever they spend their time with their loved one’s then constantly that day turns to be a great day of their life. Those who try to trick people just for the sake of a better life, they end up being unhappy with their life. Some people may suggest you not to be honest because they think that is the stupidest thing to do. But it is better to be honest instead of being stupid. Being honest can bring positive environment around people. It is even advisable that if a person starts his day with total honesty, he may end up having a comforting day in their life. Starting a day with a positive thought can create an environment that brings total positive energy around us. There are some of the elements which suggests to be used, so that it can bring some positive energy among people. Therefore, positivity is a solution for every single question that makes everyone wonder better about their lives. Therefore, being positive can turn every single day as an awesome day. Sometimes it happens that a person who works every day without any issues, seems to be lost in their own world when it comes to being mentally absent in that particular moment. It is a great lesson to learn when a person tries to start his / her life as usual and they are physically present but mentally absent while starting their daily routine. These small things can create a difference in their daily life which can lead to a bad day or a moment. Most of the people handle a bulk work in the name of being busy in their life. It is a common mistake that people commit in their day to day life and which cannot be reversed if it already started as a daily routine. To start a better day or to have an awesome day a person needs to handle less work so that he / she can be free at the end of the day and feel relaxed. Therefore, handling less work can start of a great day with a better ending. People think that whenever a person tries to plan anything in their life, it seems to be a bad plan after all when it gets easily crushed without any reason. Making promises about such plan can never get its final destination of success because people think that promises are meant to be broken and promising a better plan in their life can lead things to a bad mood of things. Therefore, to start their life better each and every day a person need to plan his / her actions. Working all day all long can bring success and achievement, but it also brings one more thing that is bad company and bad environment. Most of the time it seems that being busy is a better form of living a life but when it comes to personal space, then it is considered as a bad choice of working environment. If a person slows down a bit and try to ease things better, then he / she may end up having a personal space for themselves. A great song that motivates or which makes you happy can create a day, which can be stated as one of the greatest day of one’s life. There are people who think that music can turn things better in their lives. Music brings positive energy among people. Music makes situation light and happy. Eventually music can help one have an awesome day that they can lead every single day. Therefore, listening to great music can help you start a better day. And the bottom line is that when a person thinks of how they can live their life happily the above mentioned discussion really helps him, which suggests that incorporating all the key elements in life can make one happy every day. Therefore, if a person decides to follow all the above mentioned ideas, then it is assured that he / she can be awesome everyday in their life.